America is a paradise for shoppers with a multitude of retail stores that offer foods, electronics, clothing and much more. The savvy shoppers often make a sport of looking for the best prices through sales, discounts offers, perks, interest-free deals and much more. Many shoppers may prefer to use store cards instead of their everyday Visa card for shopping as many stores have their own cards and offer better deals. The holiday season is fast approaching and retail credit cards can really save some money. It can also help counteract the ballooning effect that holiday gifts can have on their spending. When checking out at a retail store we often come across stores offering 12 months or more free financing, if you apply for their credit card that very day. Chances are that you will be hearing this a lot more often if you accelerate your holiday shopping. No doubt these financing offers are very tempting for holiday shoppers-and many take the bait-but are stores credit cards really a good deal? The answer is yes if it is used smartly. But, before agreeing to apply for the store credit card there is one hidden trick you must be aware of otherwise your “free financing” can backfire in a very big way. One common miss-step will end up in you paying 25% to 28% more interest on purchases you make. If you want to make a large purchase with a store credit like a home appliance you may qualify for special financing. 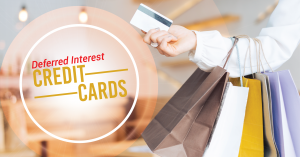 Store Credit cards that offer free financing are 0% Intro APR cards and deferred interest cards. You might reasonably assume that they work the same way, but they are different. You get 0% APR which will allow you to pay back the purchase money with no interest for a specified period such as 12 or 18 months. With Introductory 0% APR you will not be charged interest during the promotional period and interest will start to accrue only on the remaining balance. But on the other hand, differed interest cards are particularly dangerous. You will be charged interest not on the balance amount as in a 0% APR but interest will be charged on your entire purchase amount. This is a feature which is commonly found in the fine print of 0% store financing offer plans and particularly dangerous. It is like a wolf in sheep’s clothing as it pairs an enticing offer like “no interest if paid in full” or “special financing” with a clause that can turn sour. Many retailers do not disclose deferred interest clearly enough. If you make even the slightest mistake of not paying back the entire amount by the end of the interest-free period it can lead to some expensive post-holiday shopping surprises. With a deferred interest, finance offers you must pay off the entire amount in full before the promotional free financing period is over. If you do not do so then you will have to pay the full amount of interest charges as if the interest rate was effective the whole time. The moment the promotional period is over the “deferred” interest rates comes rolling back, not just the balance amount you owe but on the entire purchase amount. Let us look at an example as to how much a deferred interest card can cost. If you had 12 months to pay off a purchase of $1,500 and you had paid $540(minimum payment of $45 dollars per month) at the end of the financing period. The store will then charge you 12 months of interest on the balance which will be a walloping $321 in interest. In addition, you will still owe the $960 balance on your purchase. Whew! This is by far the biggest negative that is associated with credit cards. The interest rates of biggest retail-branded credit cards are often sky-high, with a standard 24.99% to 27.99% APR. In comparison “the current average interest rate for all credit cards is 13.08% APR”, according to the Federal Reserve. So before using a “deferred interest” store card you should plan to pay off the loan before the promotional period expires, as sometimes “unexpected things occur and you may not be able to make the payment every month”, says Bowne. You should make sure you read the terms and conditions carefully to see if the card carries an annual fee, You should also know what the go-to APR will be once deferred-interest promotion period expires. You can plan to have it paid off early by dividing the purchase price by 11 months instead of 12 months. Pay your balances each month by setting up the payment on auto pay. In this way, you can boost your chances of paying it off in time. You should avoid any extra trips to the store to avail of offers on “card member” sales and only purchase what you want. No doubt store credit cards offer you much better deals and discounts then typical cash back cards. You can save loads of money if you are a frequent shopper. But just remember not to leave a balance because “deferred interest” will always destroy any savings and rewards the cards have offered.